The action from the second day of the Panchkula leg of the Pro Kabaddi League 2018 saw the UP Yoddha battle it out against their South Indian counterparts Tamil Thalaiavas at the Tau Devilal Sports Complex in Haryana. UP Yoddha came into the match on the back of a couple of impressive wins in the past two legs in Delhi and Vizag. They have kept their hopes alive of making the playoffs run and hoped to add another win to their kitty against the Tamil Thalaivas. Prashant Kumar Rai and Nitesh Kumar were in good form for them and hoped to continue their momentum tonight as well. The Tamil Thalaivas were the first side in Zone B to bow out of the playoffs race after their loss last night against the Bengal Warriors. 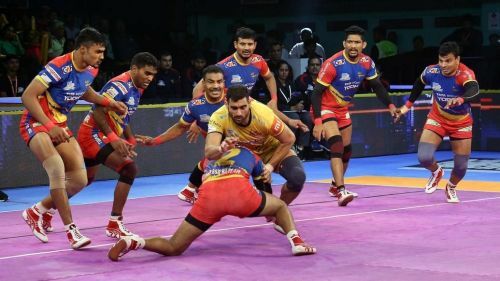 Ajay Thakur and co were unable to handle the defensive pressure by the Warriors and Maninder Singh's powerful raiding as they went down 28-21 in the match. They played for pride going ahead into the season to end in a respectable position in the standings. The first half of the match was a low-scoring affair with momentum shifting sides throughout the course of the twenty minutes. Tamil Thalaivas had the initial advantage after good raiding by Ajay Thakur and Athul MS capitalizing on mistakes from the UP Yoddha defence. Prashant Kumar Rai and Nitesh Kumar helped the UP Yoddha pull back the lead and close the deficit. The score stood 13-10 in favour of the Tamil Thalaivas at the end of the first buzzer. The second half saw the two sides employ a highly defensive approach playing the do-or-die raid strategy. It went down to the wire as Prashant Kumar Rai used his ability to pick up vital bonus points as the sides shared the spoils at 25-25 as the UP Yoddha stay in contention of a playoffs spot. The UP Yoddha skipper had a tough time to get going in the first half managing just one raid point in five attempted raids. He was replaced by Shrikant Jadhav in the second half of the match. The in-form raider was in good touch against the Tamil Thalaivas' defence picking up five raid points in the first half using his lanky frame to his advantage. He was in good form in the second half picking up crucial bonus points and scored his Super 10 on the night clinching the tie with two final bonus points. The all-rounder Sachin Kumar was used as the third raider by the UP Yoddha tonight and picked up a couple of raid points with his speed on the mat. Sagar Krishna made a start in the UP Yoddha lineup after making a few appearances off the bench and played on the left corner. He did not manage to pick a tackle point tonight. The powerhouse right corner defender continued his good run of form with a couple of strong tackles in the backline. He got his High 5 on the night and was the top scoring defender for the UP Yoddha. The veteran cover defender was a strong presence in the UP Yoddha backline providing able support to Nitesh Kumar on the corner. Narender operated alongside Jeeva Kumar in the UP Yoddha defence but was a bit vulnerable with his failed tackle attempts. The raider came off the bench in the second half and put in seven raids picking up just one raid point.